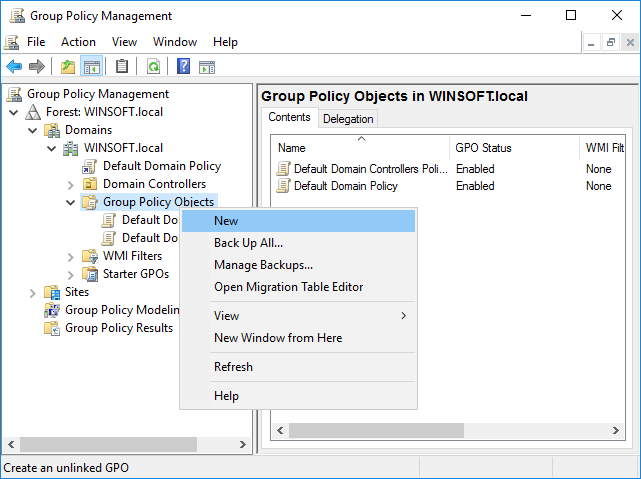 In order to manage Folder Guard software and enforce its settings on the network using Active Directory, a Group Policy Object (GPO) must be created first. Note that, depending on the complexity of your organization, you may find it necessary to create several GPOs, each serving a different purpose. For example, you may want to create one GPO to control the installation of the x86 MSI package of Folder Guard on the 32-bit computers, another GPO to install the x64 MSI package on the 64-bit computers, and yet another GPO to enforce the settings of Folder Guard. In our example, however, to keep things simple, we use just one GPO to control both the installation of Folder Guard on the network and to enforce its settings. Now that the GPO has been created, we will use it to configure Folder Guard.